Bring me your unemployed, your disabled, over-50s, Stolen Generation, refugees, ex-prisoners and transgenders…. they all come before self-made entrepreneur Creel Price with a business idea they hope will turn their life around. Creel Price retired on a $109m fortune but wants to give something back. Aided by three business assistants, Michelle Duval, Ben Reid and Shammah Dhall, he hears a variety of ideas from those who are long-term unemployed. 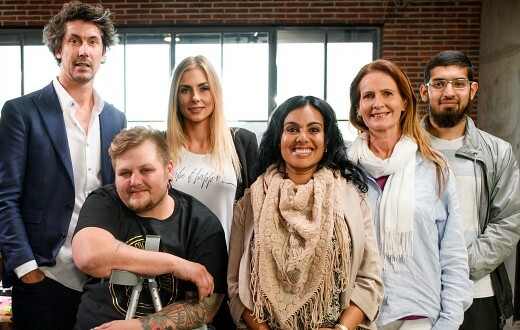 They include an amputee who wants to open an online store selling single shoes for other amputees, a single mum with an ‘eco-fashion’ concept, a Muslim man from Pakistan who dreams of a mobile fast food van with healthy foods, and a young man who has battled depression with an idea for live ‘battle’ games. But Creel is infinitely more interested in the individuals behind the concepts than business sharks on other reality television. His team choose 12 to join him on a ‘boot camp’ on the NSW South Coast, roughing it together without luxury accommodation for 3 days. All of his challenges are designed to identify skills needed in business, starting with tents. “If you can build a tent together, you can build a business together,” he explains. The doco profiles its various participants from a man who is legally blind to a young mother of 3 who was homeless to a young woman battling long-term unemployment in regional Australia. Character and spirit is sorely tested by a gruelling hike to the summit of Pigeon House Mountain, but as Price explains, whilst not everyone will make it, sometimes it is about helping the team make it to the top. If this were reality TV, this would highlight personality clashes and milk the boot camp tears for drama. But this is SBS and together with sympathetic narration from Tara Morice, the bigger themes are about highlighting deeper societal problems and extending a helping hand. As the second of some very worthy television this week (Taboo being another), this production by Eureka may be low budget and without the shiny floors primetime loves. But you can’t helped but be drawn in by its uplifting stories. The Employables airs 8:30pm Wednesdays on SBS. Taboo was wonderful. Great to see some worthy TV. I’ll be watching tonight!